Simon Downs originally trained in a particularly traditional school of illustration, but the rapid evolution of digital communications design forced him to rethink his design practice. In turn he became; a digital illustrator, a digital animator, an interaction designer, a multimedia designer and editorial designer; working in London for the finance and publishing sectors. 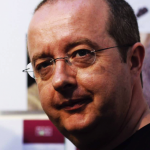 He writes on visual communication (including drawing) as a complex system, is a Director of the Drawing Research Network and has been an editor with the journal of drawing and visualisation TRACEY since 2003. In the quotes above Brooks and Goldschmidt express a commonly held and, as far as I know, reasonable model of the operation of drawing. However this kind of internalised model of drawing, as a direct transcription of thought, fails to address some key questions around the construction of a meaningful drawing and its ability to communicate to author and audience. The question to ask ourselves is: are we satisfied in visualizing the process of drawing as a ‘black box’ operation with the artist’s brain at one end and a completed drawing at the other, but without any knowledge of the processes that lay in between? We should be asking about the processes, internal to the artist and external in the world, that compose to allow a drawing to operate in a way that can effect both the artist and the viewer. But more than this, if the drawing is nothing more than a trace of an operation between artist and material, how can the author of the work possibly be surprised by the power, qualities and effects produced by its construction? A scenario that is familiar to most draftsperson. All of these questions are elements that, far from being problematic hurdles to overcome, represent clues that point to drawing (the activity) being a form of phenomena called a Complex Adaptive System that creates drawing (the artefact). If we are stopped on a street by a lost stranger asking for direction we may, on consideration, make the judgement that beyond a certain number of steps verbal directions will simply cause more problems than they solve. In such circumstances a map seems to be just the thing. So, reaching in our pocket we pull out a scrap of paper and a pencil, and knock out an impromptu schematic of the locality. Which, in turn, allows the lost stranger to reach their destination speedily and without fuss. Please stop for a moment and marvel, because this sketched map represents a commonplace miracle. Think about it. Our map forged from a head full of dense local knowledge is refined to leave a set of legible visual representations. Representations that visibly represent an intentional (Dennett, 1989) subset of our knowledge: knowledge of the world mapped onto an internal model of a stranger’s mind. Knowledge made fit, just for them. By way of an example in the figure the author was attempting to explain the act of binding a bound book into the structure of a Net (the flat construction plan of a folded 3D artefact, like a box) to an overseas student, with limited English language skills. 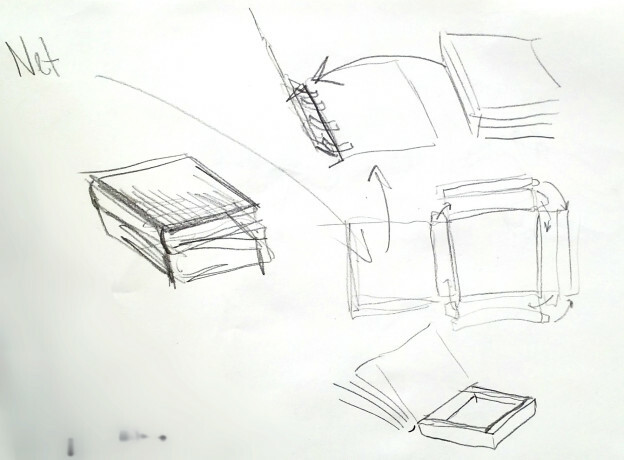 The drawing acted as quick, common, reference point for final object (a combined book and display box). Many individual elements of the conundrum are canonical: as the draughtsperson of the map we draw and evaluate the drawing for scale, fitness and completeness. A cycle of drawing, strategising and evaluation as we work (Goldschmidt, Suwa and Tversky). Dennett’s Intentional Stance offers a viable way of describing the way in which we fixed on an apposite symbol set for this notional stranger to understand the route. Norman and Baynes give us a model that describes the process of articulating a drawing to enable design. There is a mass of research describing the discrete parts: the cognitive, craft, cultural and historic functions of drawing. 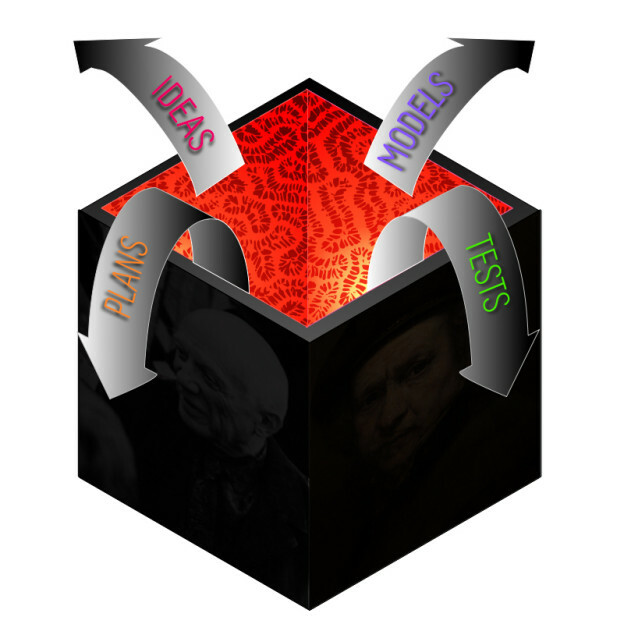 What is missing is a description that connects these varied, but canonical, descriptions in a way that acknowledges the existing models but frames them within a broader whole. Seeing each part as valid and functional while being contributory to the total. Such a framework is provided by Complexity Theory (In the case of drawing a thing called a Complex Adaptive System. ), with the drawing being the Emergent product of the system. Complexity allows for a model of drawing that acknowledges a variety of contributions being made to an individual drawing, on a case by case basis, producing results that can be original and distinct; that speak to the past and demonstrate novelty, while still existing in a framework with cultural relevance.